Timeless Classic Elegant Masterpiece! Surround yourself in complete tranquility and luxury on almost 5 spectacular acres enveloped by mountains, lush grounds and magnificent gardens. This prestigious residence has been masterfully remodeled to be one of the finest estates in Paradise Valley. With over 16, 000 square feet comprising 6 bedrooms and 9 bathrooms, this exquisite home boasts a stunning grand entrance, soaring uniquely decorated ceilings, large scale rooms with finest architectural features including sophisticated finishes throughout with details sourced the world over and a floorplan that is formal, yet creates a comfortable and inviting ambience. Other luxury amenities include; formal living and dining rooms, family style great room and open chef's kitchen, stately office/library, private bar, wine cellar, media room, large master suite with fireplace, his and hers separate bathrooms & expansive walk-in closets, exercise room, specific pets room and much more. The beautiful outdoor areas invite relaxation and recreation with vast shaded patios, sparkling pool, tranquil green lawns, lovely pond with water feature and a detached guest house. In addition, the avid car collector will enjoy the auto courtyard with lounge, various sized garages and state of the art show rooms for the perfect display of the ultimate collection. 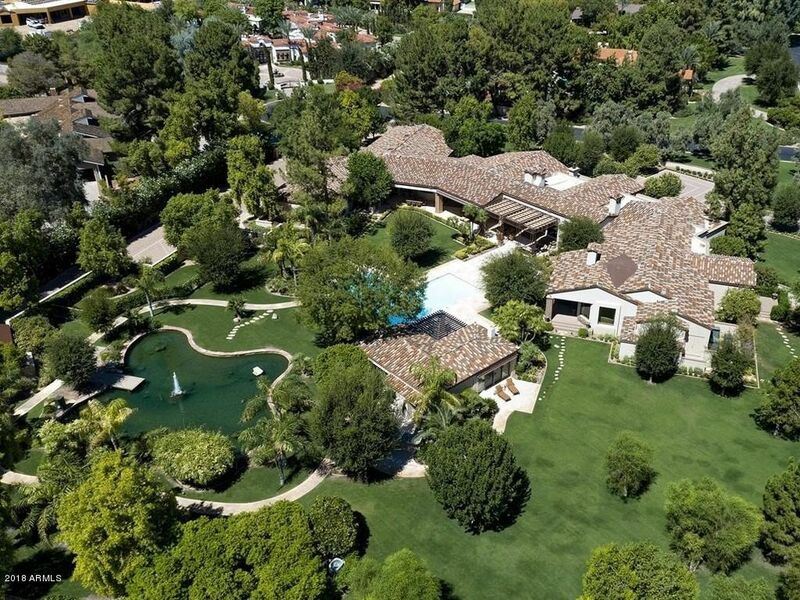 A true opportunity to acquire one of the top trophy estates in Paradise Valley, AZ. Cross Street: Martingale & Doubletree.